To learn more about these stories, read our reviews and find out where you can purchase them, simply click on their covers below. We hope you enjoy reading Dayle sharing her experience of working on these incredible mathematical story projects with you! When I was eight years old, I broke my arm riding my horse backwards. I wasn’t actually “riding” my horse, I was sitting on it backwards in the corral brushing it while it was eating hay. Another horse also in the corral decided my horse’s hay looked better than his, and when he came over to steal it, my horse ran off and I flew off. Lesson learned. Never sit on your horse backwards. Also when I was eight, (and a cowgirl), I lost my hat when it flew into the Grand Canyon. It wasn’t just any hat, it was a big, beautiful smooth brown cowboy hat, and I only had it five minutes. My parents bought it for me in the gift shop and I was wearing it when a great big wind whooshed around me. It plucked the hat right off my head, and sailed it through the air over the cliffs, and then down, down, down into the deep canyon. I like to think someone at the bottom of the canyon (probably on a mule tour ride), got a very happy surprise that day. In addition to being a writer, I am a miniature artist. That doesn’t mean I’m very, very tiny. It means I like to make very, very tiny things. I’ve made miniature food, clothes, plants and flowers, jewelry boxes - just about anything. My favorite thing to make is a room box. That’s a box where I make an entire scene full of miniatures. I have made stores, a bakery with teeny tiny cookies, cakes, and donuts, a children’s room filled with toys, fancy ladies rooms with dressers covered in tiny combs, brushes, and perfume bottles. The biggest room box I made was a library. It has a crystal chandelier that really lights up, and dozens and dozens of tiny books not much bigger than a thumbnail. Math always made sense to me. There were clearly defined rules, and if followed correctly, predictable results. Two plus two is four. There were also equations, which are sort of like puzzles for you to solve. Ten minus “x” equals seven. I enjoyed trying to figure out the answer. I guess you could say I’m a problem-solver by nature. I love a good mystery, and math is sort of like that until you uncover the answer. I especially liked geometry because it’s visual. 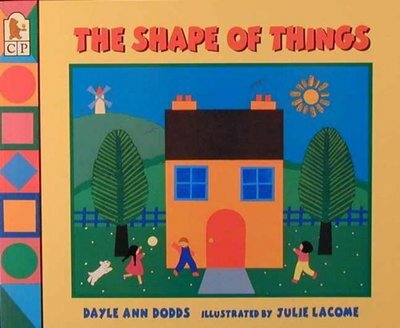 As a little girl, I loved learning about shapes and drawing them. One of my favorite doodling pastimes was to draw a two dimensional shape like a square, and then add lines and sides to make it a three dimensional shape. 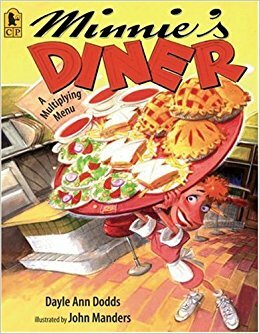 You authored 'Minnie's Diner', 'The Great Divide', 'Full House: An Invitation to Fractions’ and 'The Shape of Things’. 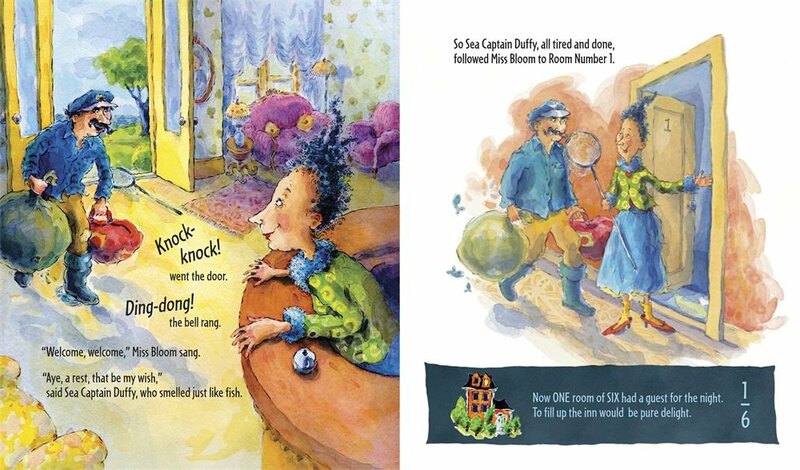 What inspired you to write these stories with a mathematical focus for young children? One day I was helping out in a kindergarten class. The teacher gave each of the children a large white piece of blank drawing paper. They were free to draw whatever they wanted. Most of the kids jumped right in, creating pictures of their family or favorite pets or activities, but I noticed one little boy just sitting and staring at the blank paper. He told me he didn’t know how to draw. I knew this to not be true, as everyone can draw something, even if it’s only a wiggle or squiggle or dot. So I asked him, “Can you draw a square?” He said “Uh-huh”, and sure enough, he put a square on his paper. Then I said, “Can you draw a triangle, and put it on top of the square?” He did that also. Voila! A house! I suggested he draw a rectangle and put it in the center of the square for a door, and two more smaller squares on each side for windows. We made circles for trees, a larger circle for the sun, and on and on. Before he knew it, he had drawn an entire picture, made of shapes put together. The next day at school he ran up to me with a wonderful new picture and a big smile on this face. “Look what I made!” he shouted. Yes indeed! 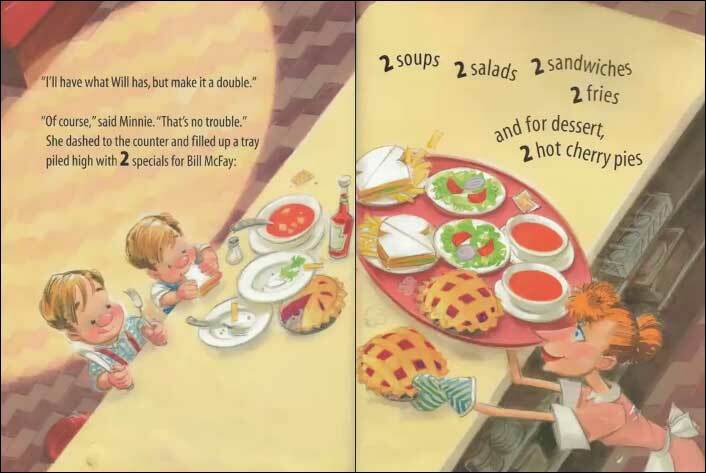 As far as my other picture book stories, what I really enjoy is taking a basic math concept such as addition, subtraction, multiplication, division, etc., and then thinking of a fun way to incorporate it into a story children will enjoy. Math and mathematical concepts are all around us, and truly do make up this amazing world we live in. Some mathematical story authors prefer to have a context and setting as closely related to children’s real-world experience as much as possible. Some prefer fantasy. In the specific context of mathematical stories, what is your preference, and why? Both. I thoroughly enjoy the process of taking real life characters and moving them into fantastical places and experiences. It’s sort of like “The Lion, the Witch, and the Wardrobe.” Three bored kids find a door in the back of a closet, and off they go to a wonderful imaginative adventure. What were some of the key stages that you went through in creating your maths picturebooks? I always decide on the concept first. 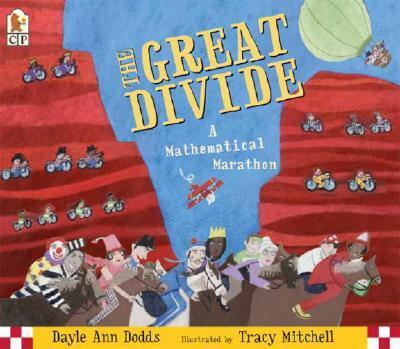 For example, with 'The Great Divide', I knew I wanted to do a book on division. Then I just let the ideas float in my mind for awhile, and see what comes up. Usually, for me, the next step appears as a visual image. I’ll be driving in my car, or taking a shower (warm water is great for allowing creative ideas to flow), or taking a walk, or shopping at the grocery store, and WHAM! An idea will come as a picture or pictures in my mind. I can’t explain why or how they do, they just do. It’s sort of like sending out an invitation, and eventually something interesting usually shows up. Next, I’ll begin playing around with words, phrases, sentences. I love to write in rhyme, so I’ll see if I can figure out how to tell the story with rhyming words. That is a terrific challenge, and I thoroughly enjoy the process. Even though I’m not an illustrator, I do work very visually when creating a book. It is often said that a picture book is a marriage between words and pictures, so making it work visually is very important to me. I see the pictures in my mind, and I need to know how or if my idea will work in a book format. I always make a dummy - which is like a “pretend” book.” I do this by getting an inexpensive drawing pad and numbering the pages. Then I paste in the words and draw pictures page by page to go with them. When my children were young, I used to show them my new “book” by reading the dummy and having them look at my pictures. This helped me see if the concept was working and the story was something kids would enjoy. I will insert here that once I send off the manuscript, I am super excited to see what the actual illustrator will do with the text and concept I’ve created. It’s always a great surprise, and I’ve never been disappointed. For me the most challenging is also the most satisfying when I get it right. As I mentioned before, I write many of my books in rhyme. So once I have decided on my concept, see the visual picture in my mind, it’s time to start writing the story. I’ll spend hours thinking of lines that are simple, descriptive, and fun (fun is an important requirement for my stories). Sometimes these lines come out easily, such as “A square is just a square, until you add a roof, two windows and a door, and then it’s much much more.” Other times I can think and think and it may be days or weeks before just the right rhyme will appear. Sometimes I have to work at it, and other times the right words or phrases will just pop into my mind! That’s great when it happens. As far as rhyming words, I guess you could say I have a natural ability to do that. I’ll also let you in on a little secret. I have a wonderful yellow rhyming dictionary I have used for years and years. I always start writing the lines and figuring out the rhyming words first myself, but if I get stuck, I rely on my book. And did you know there are words that cannot be rhymed no matter how hard you try? See if you can find a rhyming word for “purple.” Not going to happen! That’s why it’s great to have a book to tell you it’s better to choose another word. It depends. Sometimes once I’ve chosen the mathematical concept, the story comes to me rather quickly. Take 'Minnie’s Diner', for example. I decided I wanted to write a book on multiplication, and I wanted it to be funny. When I was young our family had a weekend ranch in a small Northern California town. My father, a true “weekend cowboy,” would often take us kids to a wonderful diner in town that served what he called “cowboy breakfast” - eggs, pancakes with fresh berries and delicious sticky maple syrup, bacon, orange juice. That breakfast was so big, I could never finish it. I just remember there being more, and more, and more! 'Minnie’s Diner' was born from that memory. Some of the other stories I’ve written have come from experiences my own children, family, friends had. And some simply appear out of nowhere. To what extent did you have a say in the illustrating process, particularly in relation to the visualization of mathematical concepts? Like I mentioned earlier, I find it extremely necessary to visualise my books as I’m writing them. I need to make sure the math concept is carried through the story from beginning to end. If there is a visual component to it that I feels needs explanation, I will send along my rough dummy to help explain what I’m seeing. Generally however, I like to watch the illustrator bring his or her talents to the project. It’s so thrilling to see what different artists come up with. Often I am given thumbnail illustrations of what the pictures may be, and I appreciate that opportunity. I try to respect the artist’s process, and only comment on changes when I feel strongly about something - which luckily hasn’t happened often. In my book 'The Color Box' (non-mathematical), I wrote the story with the idea that a little boy climbed inside a box that took him to several worlds of color. The illustrator chose a blackbird for the main character, and that didn’t feel right to me. We were able to co-operate on the issue, and a monkey became the main character, which turned out great. In 'The Prince Won’t Go to Bed' (non-mathematical), the illustrator, Kyrsten Brooker, did amazing illustrations of collages using both drawings and real objects. On one page I noticed some torn bits from a newspaper as part of the collage. On further inspection, I spotted some objectionable words not meant for kids’ eyes. It was a simple oversight that went past illustrator, editor, and art director, and I was glad to have noticed it. Speaking of which, children are extremely quick and clever at spotting anything that is out of place in either text or illustrations! I do this pretty intrinsically. I guess because I have a teaching background, have studied and read so many children’s books, and have been a parent for many years, I just know what words kids in my target range understand. That doesn’t mean I don’t like to throw in a word or two that they may not know. In my book “Wheel Away!” the wheel gets loose from the boy’s bicycle and rolls into town where there is a bazaar going on. That’s a new word for most kids, and it offered a new learning opportunity. As far as length, yes, picture books are generally 32 pages, with 4 pages for “front matter.” So you’re really looking at only 28 pages for text and illustrations. I have never been asked to limit the number of words per page, but I do that automatically. Picture books usually have relatively few words per page. Again, the words tell only half the story, and the pictures tell the rest. It’s part of the creative challenge to see if you can get your story across with as few words as possible. On reflection, how would you comment on the diversity of the books’ characters in your mathematical stories Would you have done anything differently in terms of the diversity of the books’ characters? ​Can your fans expect to read any more stories with mathematical connections from you in the soon future? Yes! I have just finished a picture book that deals with volume and spatial relationships called 'Romney, Pack Your Bags!' It’s about a little boy who has to pack his own suitcase for the first time to go on vacation. He feels he needs to bring more and more and more, and the suitcases get bigger and bigger and bigger until…well, you’ll just have to see! I’m also working on a fun new idea on identifying and predicting patterns of different colors and shapes. There are many. Some of the all time favorites include 'The 500 Hats of Bartholomew Cubbins' by Dr. Seuss, 'The Little Mouse, the Red Ripe Strawberry and the Big Hungry Bear' by Audrey and Don Wood, and 'Inch by Inch' by L. Lionni. What I like about each of these books is that there is a highly entertaining story that incorporates math. That’s my favorite type of math-related book. The math concepts are woven in, but the story itself is truly enjoyable on its own. "Mathematics and imagination can absolutely go together. Math doesn’t have to be boring, or confusing, or overwhelming. It can be fun and useful and even suspenseful at times." Mathematics and imagination can absolutely go together. Math doesn’t have to be boring, or confusing, or overwhelming. It can be fun and useful and even suspenseful at times. What will happen if I do this? How can I use that information to solve this challenge or mystery? How funny is it when 500 hats appear on the same person’s head? How far away are the stars or the moon? How many makes a dozen? What is a sphere? How big is an ant? How many toes does a platypus have? How many cups of flour would you need to make the biggest birthday cake in the world? Math is part of every day, and everything we see, hear, taste, smell and touch. But it’s more than that. It conjures up amazing ideas for our imagination to explore. It’s like swimming in a lake. Yes, you can stand on the shore and look out at the peaceful blue water shimmering in the sunlight. If you’re lucky you can even see floating logs with turtles sunning themselves on top, or hear the occasional “bloop” of a big old frog jumping into the water. But in order to truly experience the lake, you need to jump in. Get your feet wet, get your whole self wet, swim around, splash a bit, squish your toes in the soft sandy bottom. Think it, sense it, and then use what you know to make it work. Math is your toolbox to help you build what you imagine. And what an incredible toolbox it is! Do you think teaching mathematics through storytelling (particularly in the format of illustrated storybooks) could be used with secondary school students too? What would you say to secondary school teachers who are hesitant / skeptic about the use of this approach to make maths learning more accessible for their students? I would say they have not done their research. Just because a book is in a storybook format doesn’t mean it can’t be interesting to older students also. Look at Rube Goldberg and his fantastical cause and effect machines. (My picture book 'Henry’s Amazing Machine' was partly inspired by his inventions). Or David MaCaulay’s 'The Way Things Work' books. Size, shape, depth, volume, physics, estimations and more to explore. In addition there are numerous middle grade novels to be found, where the main character faces a challenge or obstacle and must incorporate his or her knowledge of mathematical principles and concepts to save the day. Start simple. Use the “what if” question. Many authors, including myself, find this a helpful tool. For example, what if there was a tree with ten juicy apples on it, and a hungry horse came walking by. What might happen then? Encourage them to explore all sorts of possibilities, realistic or far-fetched. Remember that writing is re-writing. Remind them that we writers often try many many times before we get a finished book. When they feel like they are ready to create a book, help them staple together pieces of paper or get an inexpensive kid’s drawing pad so they can see and feel what it’s like to turn the pages. Another technique kids can use if they’re not especially confident about their own drawing skills, is to cut pictures out of magazines and use those to help illustrate. Well, I have taught entire courses about this. In a nutshell, I would say if possible take a course on writing for children. A lot of people think writing children’s books is easy, and they don’t realize all the many factors that are involved. In order to give yourself your best chance of success, learn all you can. If possible, join a writer’s group and be open to critiques of your work. You want to be sure your story is as ready as can be before sending it out. Research which publishers accept the type of story you’ve written, what their guidelines are, and if they accept unsolicited manuscripts (assuming you don’t have an agent). It’s a highly competitive field, so you want to put your best foot forward. Once you submit, be patient, and be persistent. All writers face rejection, but you need to keep trying. In America, I also encourage new writers to join The Society of Children’s Writers and Illustrators. They publish a wonderful newsletter that helps you keep informed on what’s happening in the world of children’s literature. The MathsThroughStories.org website is wonderful. I especially like resources that list books and stories that incorporate mathematical themes and concepts for teachers and parents. 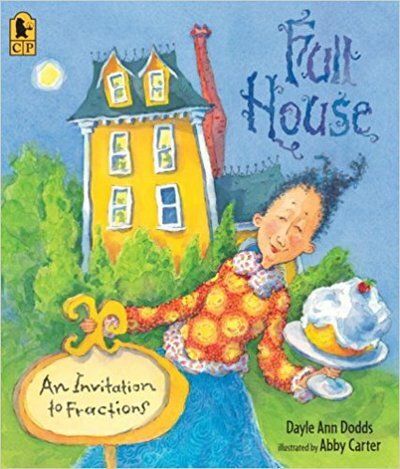 ​​Illustrations copyright © 2003 by Abby Carter from Full House: An Invitation to Fractions by Dayle Ann Dodds. Candlewick Press. All Rights Reserved. 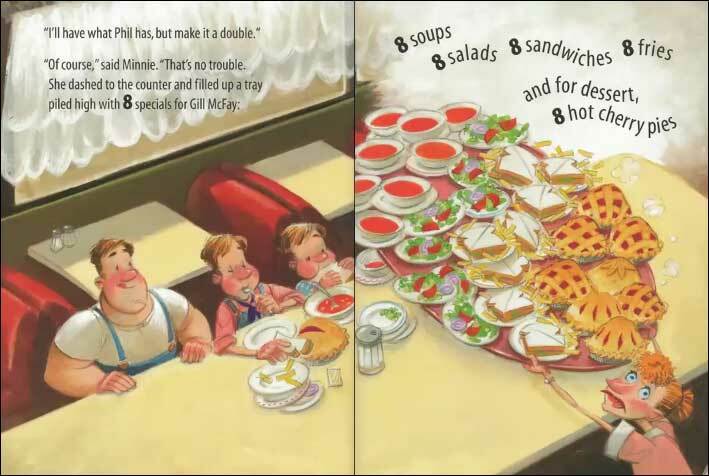 ​​Illustrations copyright © 2007 by John Manders from Minnie's Diner: A Multiplying Menu by Dayle Ann Dodds. Candlewick Press. All Rights Reserved. Have comments about this interview or Dayle's books?